This virtual field trip on a disc takes students to Algonquin Park in Ontario, Canada, where they can explore a bog without getting wet feet. 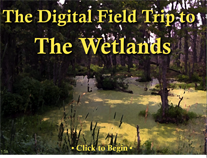 Photos, videos, animations and interactive exercises help students learn about a wide range of topics including, but not limited to: wetland types and why they are so important, wetland plants and animals, food webs, energy chains, climate, soils and decomposition, botany and how humans affect this important ecosystem. Students can watch photosynthesis in action, play the bog food web game, learn about trophic levels, nutrient cycles or migratory birds. They can discover how a bog is formed and the importance of this vital ecosystem. Video clips, animations, narrations, games, quizzes and full-color photographs make learning fun. While not all topics/activities are suitable for younger children, this CD supports learning for Grades K-12. Electronic versions of the workbook materials are included on the disc in a printable format. Printed workbook materials are available by special order (in North America only) email marketing@digitalfrog.com or call 1-800-FROG(3764) for information. The Home License includes the same content as the educational versions but, just like the DVDs you rent, is licensed for home use only. Ideal for homeschoolers. it is licensed for three computers in your home with no expiry date.